For the first time this year, IDTechEx is co-locating its Photovoltaics Asia event alongside Printed Electronics Asia. Production of photovoltaics in Asia has now overtaken the rest of the world combined. All attendees have access to both events. Over 50 International speakers at Printed Electronics/Photovoltaics Asia will present on the latest research and applications, with simultaneous Japanese-English translation. 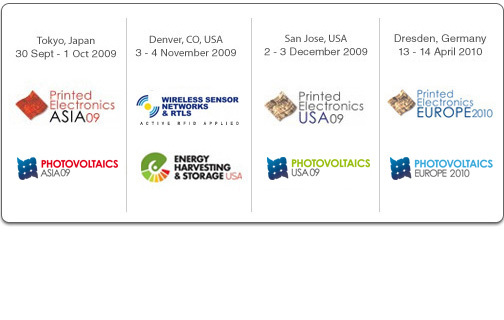 The Exhibition, the largest of its kind in Asia will feature Printed Electronics in action. The four optional expert-led Masterclasses are interactive consultancy sessions, giving you the chance to handle samples and take away printed copies of the presentations. The Masterclasses are led by world recognised experts. They will ensure you get the most from the conference and leave with answers to your questions. The IDTechEx-led tours allow you to visit the leading printed electronics organisations in Japan for an exclusive insight into their work and progress. Previous visits have included Sony, Toppan Forms, DaiNippon Printing, Mitsubishi, Hodogaya Chemical, Toppan Printing and University of Tokyo. What are the strengths and weaknesses of companies in East Asia? What do they need that you can supply? What are they are doing? Who are the right contacts in these massive organizations? How are the projects being funded and what level of funding is available? These are the issues the event will address for you. Learn about all the technologies, all the applications and all the opportunity at Printed Electronics Asia. IDTechEx is running an exclusive VIP Tour to Tokyo, Japan with company visits, a 2 day conference and exhibition. Meet, learn from, and network with the leading companies involved in organic, printed inorganic and other thin film electronics in East Asia.